In Tableau Desktop you have a workbook that is composed of dashboards and worksheets. A dashboard is like a canvas where you drop in one or more worksheets. You can also add other graphical elements and controls to the dashboard. Within a given workbook in Tableau Desktop, both dashboards and worksheets can be published to Tableau Server, where they then become views in Tableau Server. Dashboards: Pulling the data from a published dashboard does not work very well. It only gives the data from the first (alphabetic order) worksheet in the dashboard. You will probably want to publish dashboards for your users to see and use. But you will want to make the underlying data available so that Metric Insights can pull. So you must also publish your worksheets. 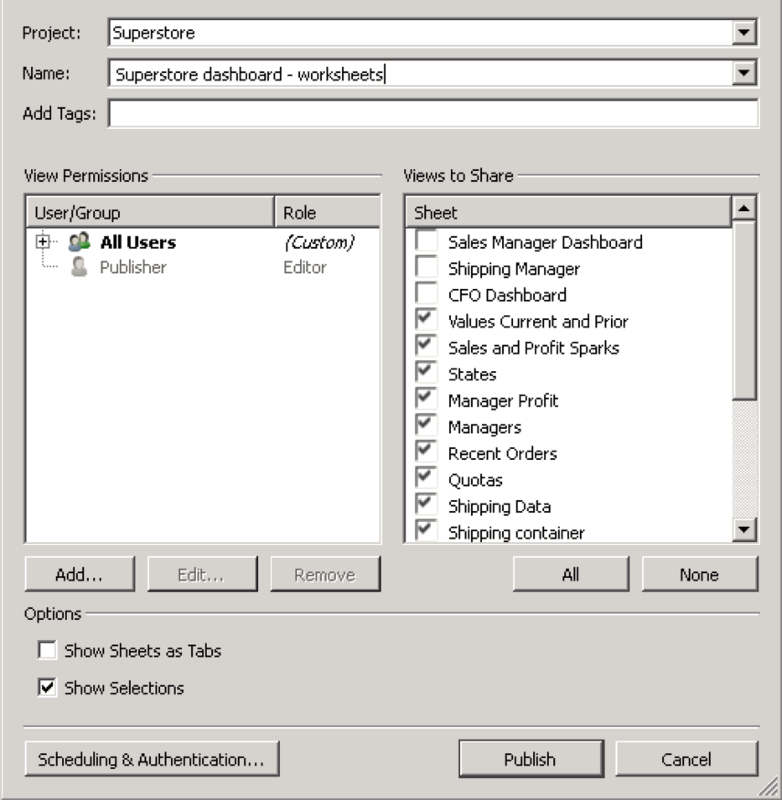 OPTION 1: Publish all worksheets in same workbook: One approach is to publish all the worksheets in addition to the dashboards under a given Tableau Desktop workbook. Then if you don't want your users to see the worksheets you deny permissions on the worksheets to all users. See section below for instructions. OPTION 2: Publish all worksheets in separate workbook: Another approach is to publish your one workbook from Tableau Desktop to two workbooks in Tableau Server. The first workbook has just the dashboard views in Tableau Server that your users access. And the second workbook has just the worksheet views in Tableau Server that only Metric Insights accesses. See section below for instructions. For the one approach described above, you publish the worksheets with the dashboard, but you make the worksheet views on Tableau Server only available to Metric Insights, and not visible to your users. This section describes how to do that. First, in Tableau Desktop, publish all worksheets in addition to the dashboards in the same workbook on Tableau Server. Note, if you choose "hide sheet" option in Tableau Desktop, then the worksheet is not an option under Publish to Server to publish as a view. So you must "unhide sheet" before you can publish the worksheet. Then on Tableau Server, select the worksheet Views that you don't want your users to see, and select Permissions link at top of screen to edit permission for the selected views. 1. Next, un-check the view button to remove access to all the users. This approach works if you are signed in with the credentials that Metric Insights uses for pulling data. 2. An alternate approach is to select the edit link to the right of your workbook. If you chose to Edit the permissions instead of Removing the permissions in the previous step, then follow these instructions. Select Deny for View permissions for any or all of your users. Do not deny view access for the Tableau user account that Metric Insights will use. In this example, we deny view for All Users. We do that because we are currently signed in with the Tableau user account that we use in Metric Insights for pulling the data from the views. As a different approach, you publish your dashboards in one workbook on Tableau Server, and your worksheets in a separate workbook. And you make the worksheet views on Tableau Server available to Metric Insights but not visible to your users. First, on Tableau Desktop publish your dashboards to the workbook on Tableau Server as you would normally do. Then, on Tableau Desktop choose to publish your worksheets to a separate workbook on Tableau Server. When publishing this workbook with worksheets, choose Add / Edit permissions to select Deny for View permissions to any or all of your users. If you are not signed in as the same Tableau user account that Metric Insights uses, then make sure that user has view permission too. Finally, publish this workbook. Now only the user that published this workbook with the worksheets can access, and any additional users you gave View permission to.